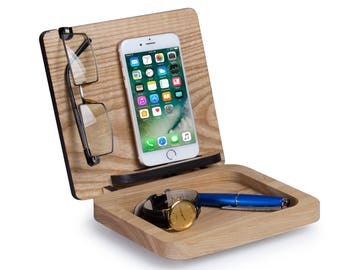 This personalized Docking Station is made for your order from Oak solid wood. We use only natural materials and water based eco friendly finish coating. Master carefully selects Each piece of wood so you can enjoy its beautiful texture. 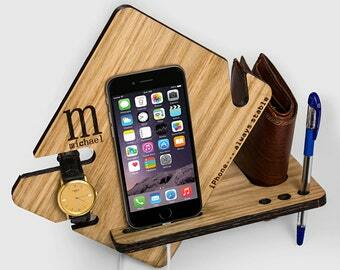 Each item is unique, as the unique texture of natural wood. 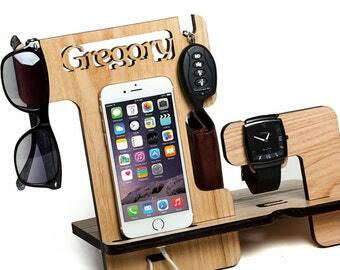 Personal laser monogram will emphasize the value of your gift. 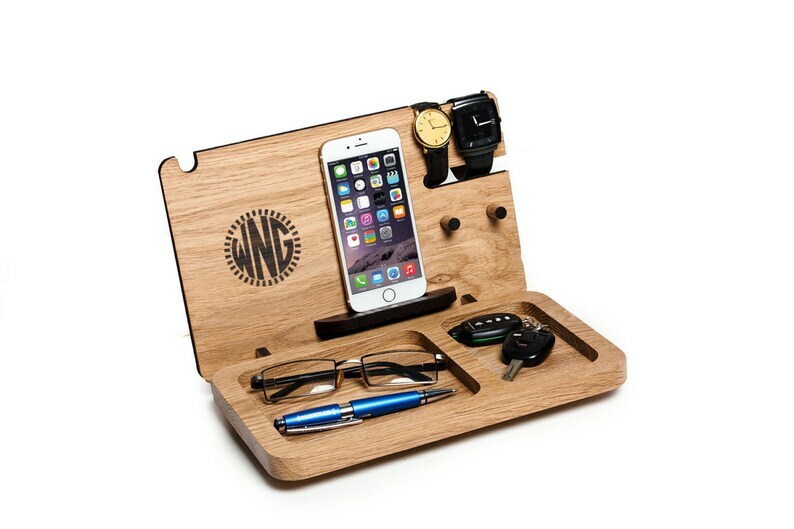 This is the perfect gift for a husband or boyfriend, a gift for the boss or employee for any occasion. Stand has an opening for cable charger. 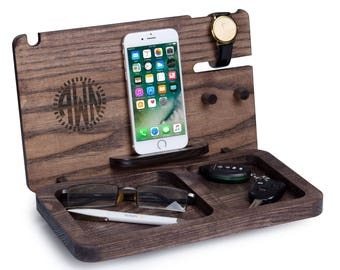 This wooden holder suitable for iPhone 6, iPhone 6s, Iphone SE and other smartphones with a screen size of less than 5.2 inches. For the iPhone 6 Plus, iphone 6S Plus, iPhone 5s and iphone SE in my store also has such a model. See it in the list of products. 3. Put the custom information you would like on your Iphone Holder in the "Notes to seller" section, exactly how you would like it to appear. Your order will be ready for shipment in 3-5 business days. Please treat with understanding to the fact that solid wood - a natural material and its texture may be slightly different from these photos. 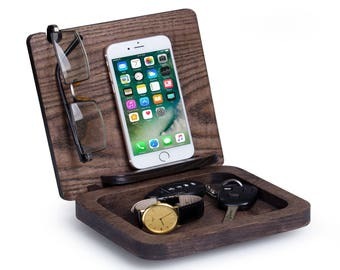 Mens Christmas, gray rustic style personalized docking station, slot for apple watch charger. Anniversary gift, gift for husband or father. I got this as a gift for my boyfriend and he loved it. 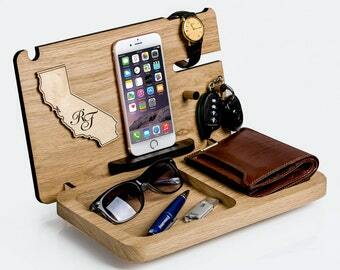 Awesome Father's Day gift, very simple and classic!! Excellent communication with seller and quick ship!! Love it! If you want to pay other way - contact me. I will ship as soon as the money is received. If in your country there are taxes and fees at the border crossing for such a product - you pay for them yourself. They are not included in the price specified here. If the goods are damaged in transit or if you notice that there my manufacturing defect - please contact me before you leave a bad review. I will respond very quickly and will do my best to make you satisfied. I send the national postal service, first class. Dates are approximate and may vary depending on the customs procedures in your country or a big burden on the postal service during the holidays. I send to your address listed in Etsy. Make sure that it is correct for the mail.